Receive every month a named archaeological arrowhead type. These arrowheads come in a shadow box with a descriptive card listing location, time span, and other details about each specific archaeological replica. Currently available at a low yearly subscription price of $105 plus shipping. That includes twelve named arrowhead varities, their boxes, and descriptive cards. Currently the focus will be on arrowhead types from California and the Great Basin. More information about the monthly available featured arrowhead type will be coming. Individual Arrowhead Types such as are featured through the club are available on our Arrowhead Type Replica Page. A set of selected arrowhead types from the Western Region (Northwest, California, and Great Basin) displayed labeled in a Riker Mount. A set of selected arrowhead types from the Plains Region displayed labeled in a Riker Mount. A set of selected arrowhead types from the Eastern Region displayed labeled in a Riker Mount. 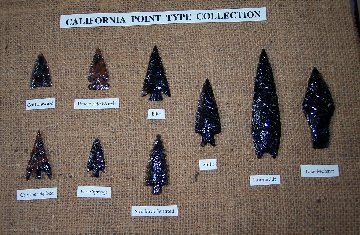 A set of selected arrowhead types from the California Region displayed labeled in a Riker Mount.